I am in the caregiver role right now. We are living with my Dad in his home because he is getting to the point where he can't take care of his home by himself. We actually help him pay a lot of the mortgage, utilities, and help him with transportation and food. He is so wonderful and appreciative and I'm so grateful that I am in a position to be able to do this for him because I get so much more out of it than he does! He has been shopping around trying to find the best insurance that fits his needs. He had a broker come the other day and explain the different aspects of insurance. He opted to keep his plan because it lets him have a free gym membership and he goes to the gym everyday and walks on the treadmill. In regards to myself, I don't see myself as a "senior" yet, having just turned 29 this past year (heh heh), but the AARP is circling around me like a vulture waiting for me to get to that point. I don't even know what age you should be to be considered a senior. Is it 50? Or 60? I must get a letter from them at least once every few months. I just file it in my shredder because I am in great health and my gosh, 50 is a long way from 29, wouldn't you say? But should I ever get to a point where I am interested in that kind of coverage, I got a heads up from 1-800-MediGap. Seniors covered with Medicare do have health coverage, but it is in no way comprehensive. Many seniors opt to get additional private insurance to cover the "gap" that is left with only Medicare coverage Parts A & B. Medigap is a private insurance company that has many advantages. It is endorsed by 'Esteemed Living' magazine and gives their customers many tools to figure out what plan would be the best for them. One plan, in particular, the Plan F, has the most comprehensive coverage available. With this plan type, aside from your monthly premiums, you would have no additional out-of-pocket monthly expenses! These plans are the most pricey but a lot of seniors like to have the convenience of being able to budget their healthcare into their income with no surprises! "With Plan F from 1- 800-Medigap you have the peace of mind to know that you are covered for all eventualities and hence won`t be hit by unforeseen medical cost that can run in to the thousands. 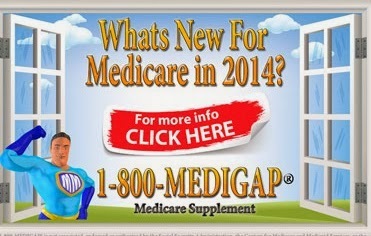 You can check out this plan at: http://1-800-medigap.com/medicare-plan-f.php." Additionally, and of interest to me, 1-800-Medigap.com offers free downloadable guides on taking care of an elderly loved one, money saving tips, and various medical plans. This is super important, if you are a caregiver like me! They also have an interactive tools page that includes a medical coverage decision maker quiz, a plan comparison sheet, and a medical terms and definition guide. As I visited the site myself, I saw a lot of very helpful tools that would make understanding the whole insurance acquisition process a whole lot easier to understand. I would definitely recommend that if you are in a care-giver role or are looking to bridge the gap between your Medicaid benefits and actual coverage that you get a no-obligation, free quote from 1- 800-Medigap.com (1-800-633-4427)! One plan in Particular, the Plan F, has the most comprehensive coverage available. With this plan type, it virtually means that aside from your monthly premium, you would have ZERO additional out-of-pocket expenses! These plans are the most expensive, but many seniors take advantage of Medigap Plan F because they find it easier to budget a set monthly amount, knowing that no matter what happens that they will never have to pay more, than trying to account for all of the incidentals. These Medigap polices are nice to have if a Senior can afford it. A lot of Seniors can not afford the extra policy. But it is such a good idea to have with the cost of health insurance being so expensive. I am glad that you are able to help your Dad with his care.I help take care of my elderly Father. It is the biggest challengefor me taking care of an elderly parent. And by AARP standards, you are considered a Senior at 50! Tara-I think it's getting even more confusing too. I'm glad that your parents had no problems with that. Julie - For sure, I think it is a great investment if you can possibly afford it, It's so stressful knowing that you need healthcare but can't afford it. As someone who has worked in the health field and know many people who currently do, I recommend supplemental insurance. Most insurance plans, Medicare especially, do not offer enough coverage for seniors or people with chronic conditions. Long-term care benefits are extra important. Pam, thanks for your valuable insight, as one who has seen the ramifications of having only Medicare. My question is, now that the Affordable Healthcare Act is in effect, will the cost of supplemental insurance go up or stay about the same?